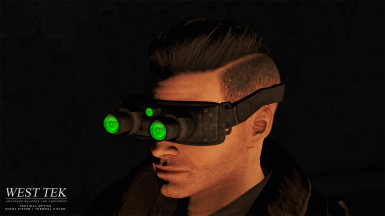 Night Vision / Thermal / Targeting HUD goggles and eyepieces with new meshes and HD textures. Fully modular, craftable, upgradeable. 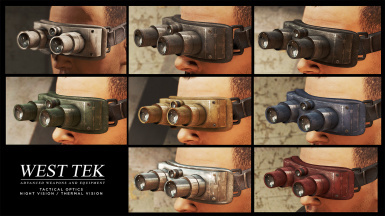 3 vision effects, 8 colors, and 2 additional targeting enhancements. 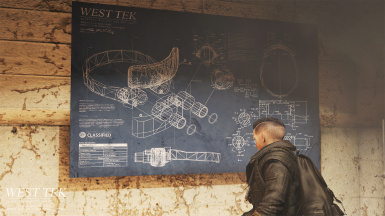 Schematics posters also in the Workshop! 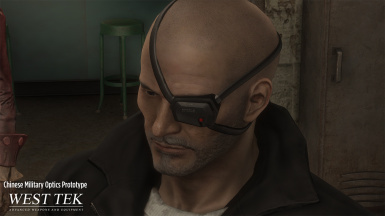 Translations are allowed if they are only the ESP plugin, require the main mod, and are uploaded to Nexus only. 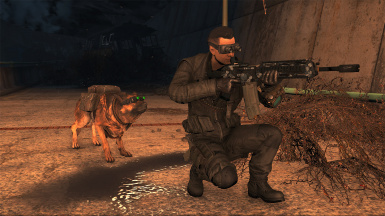 No items or other content from this mod may be used or re-uploaded without my express permission. Please contact me if you'd like to use anything. 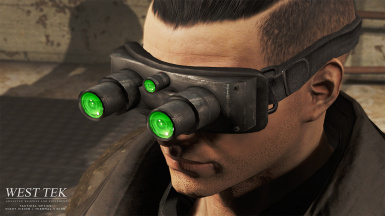 Still looking at ways to combat the blackout problem with using these with night vision rifle scopes; it's an engine problem I have to work around somehow. Completely re-made to accommodate new, more complex features. 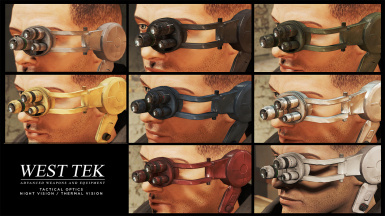 All vision effects and toggle/cycle switches now available on Power Armor helmets! Added a couple missing meshes, woops! VERSION 2.0 IS HERE! PLEASE READ THIS GUIDE ON UPDATING!! EVERYTHING IS COVERED IN THE VIDEOS HERE! 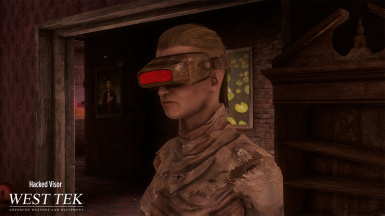 As of version 2.0, a toggle switch is implemented, and a multi-vision mode with vision cycling can be added. 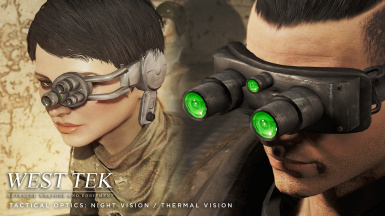 In addition, ALL VISION MODES ARE AVAILABLE ON POWER ARMORS! 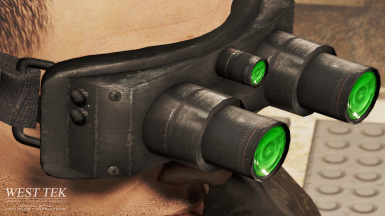 Lastly, the goggles have the option to animate up onto the forehead position when toggles! Please see this article or watch the video for details! 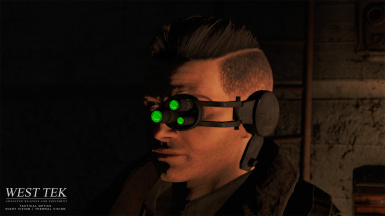 The night vision goggles are a 100% new mesh and textures that I made from scratch, and am pretty happy how they turned out. 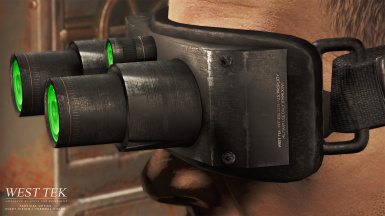 The eyepiece I cut out of the Institute Worker outfit, added a few things, cleaned it up, fixed the UV and made new textures. 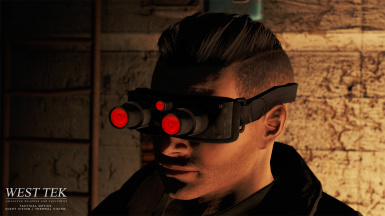 The vision modes were made for dark environments, and as such it is highly recommended to be paired along with mods such as Darker Nights and Interiors Enhanced. I am open to making variants of brightness levels, but please understand I can't accommodate every request, as everyone's monitor brightness and viewing situations are wildly different. Installation should be straight forward. Use NMM or extract the files to your /DATA/ folder. 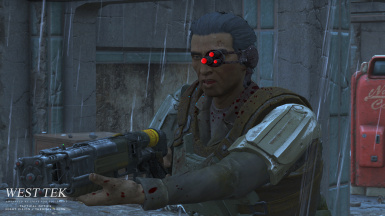 IF YOU ARE GOING TO UNINSTALL, PLEASE REMOVE THE GOGGLES FIRST BEFORE YOU SAVE YOUR GAME AND REMOVE THE MOD! 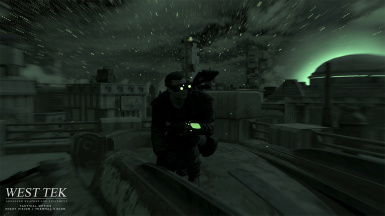 Night Vision -- Three levels of brightness available. 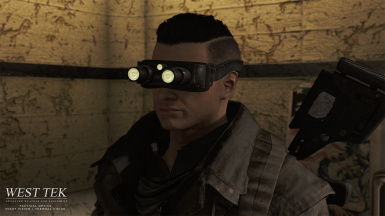 Made for the darkest areas, and somewhat mimics real night vision. Lenses glow green. Thermal -- Two levels of brightness, but makes all living things glow red. 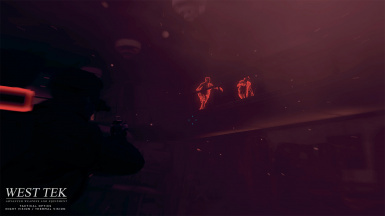 Dead bodies turn blue and stay visible for 15 minutes after death for easy looting in the dark. 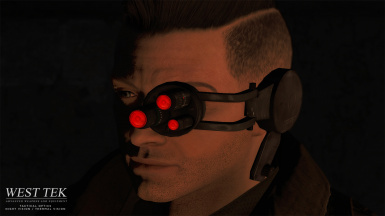 Lenses also glow red. 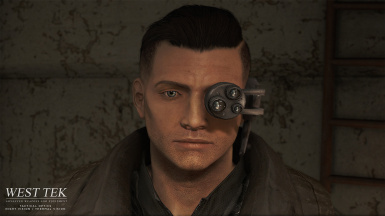 Targeting HUD -- The same mode you know from the Power Armor. Does not enhance light but highlights targets. Lenses glow white. 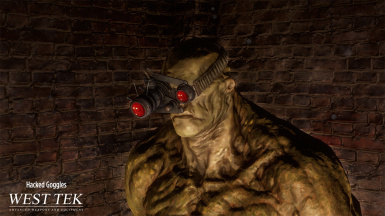 Each vision mode has a "cosmetic" version that does not apply a vision effect, but simply makes the lenses glow their respective colors. 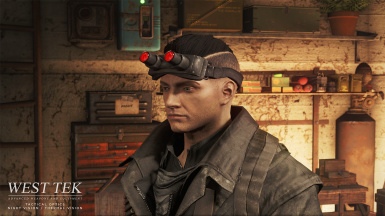 In order to craft or upgrade these items, you will need to find the schematics, which can be found in the Med Tek Research lobby under the desk in the entry / reception area, along with a delivery letter. 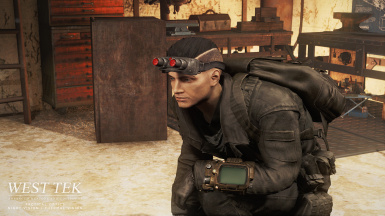 Reading these schematics will permanently unlock crafting at the Chem Station under Utility, or if you download the patch, crafting will be moved to the AWKCR Crafting Bench under ACCESSORIES - CYBERTECH. You will also require the first level of the Armorer and Science perks. 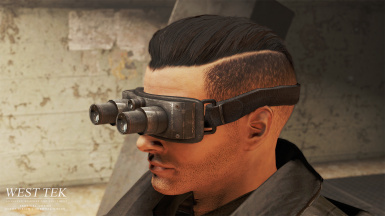 The high-tech goggles have a low chance to spawn on high-level Gunners, low-tech on Raiders and Super Mutants. 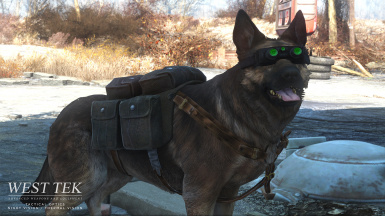 They will also be for sale by Lucas Miller, Cricket, KLE-O, and Proctor Teagan starting around level 16, so there's a chance you can find some out in the wild. However, you cannot modify any optics you find until you have read the schematics and have the required perks. There are two options available for lists, Standard (which will require merging into your patch by hand, my preference) or Script-Injected, which is plug-and-play. 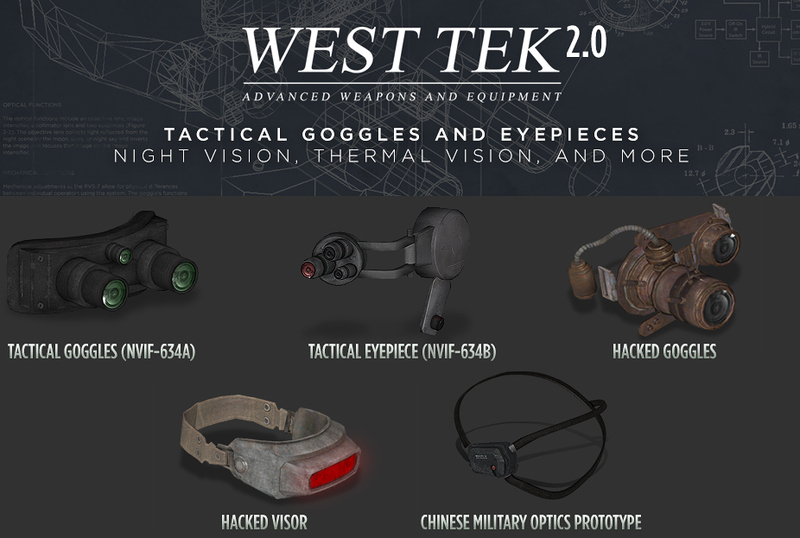 West Tek was a pre-war defense contractor working for the United States government, which created the T-45d and T-51b power armors, as well as the FEV virus. 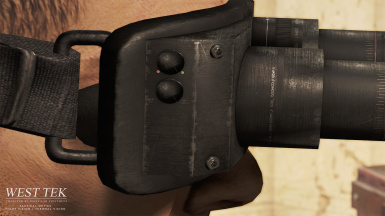 If you read the delivery letter you'll learn a bit more about where these optics came from. 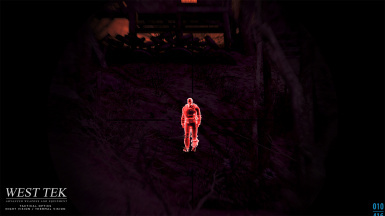 Version 2.0 is compatible with Customizable Targeting HUD if you're using basic highlighting. However, if you are using the version that highlights enemies and friendlies separately, some work is required. 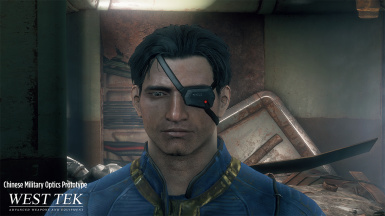 User yuva put together a handy little guide on making a quick patch in FO4Edit, which can be read here. Thanks, yuva!